Persimmons are an edible, orange/yellow coloured fruit originally believed to have originated from China before being introduced to close by countries Japan and Korea. Considered an exotic fruit in Australia, the annual production of persimmons has increased steadily since the 60s. Increased promotion, knowledge and research on persimmons has shown it to be a highly potent food providing many health benefits. Growing well in dry and hot weather conditions, Persimmon’s are extremely suited to Australian climates and are usually available at the end of summer till the start of Winter. Persimmons are generally deep orange in colour but can range from orange-yellow to orange brown. There are two main types of persimmons; astringent and non-astringent. Astringent persimmons ripen very fast after harvest and can be eaten like an apple. Non-astringent persimmon’s take longer to ripen, but can be eaten when the fruit is harder or when the fruit is soft. For non-astringent persimmons, which are flatter, it is best to remove the skin before eating, as the fruit’s skin can cause unpleasant but non-dangerous side effects on the tongue. The average persimmon fruit is 300g and contains anywhere up to 8 seeds, although seedless varieties exist. Persimmons generally contain more sugars than most fruits including apples, peaches, pears and oranges. They are also high in vitamin C, often with 2-4 times the amount of vitamin C of the standard orange. However, the amount of vitamin C often decreases dramatically the more the fruit ripens. Persimmon’s are also extremely high in vitamin B2, providing twice the recommended daily amount per 100g and also high in dietary fibre with an average fruit providing a third of your daily recommended intake of fibre. Lipid metabolism– with a decrease in the amount of the bad ‘LDL’ cholesterol. Glucose Metabolism – with a potential reduction in the amount of carbohydrates absorbed in the gut. While persimmon’s a generally safe even in high doses with no studies stating otherwise, it is quite a high calorie and high sugar food so excess consumption may result in weight gain. The peel of the unripened persimmon can react with acids to form an insoluble substance which can stick to the gastrointestinal tract, however this does not pose an issue unless extremely large amounts of the unripened fruit are consumed. In folklore, excessive persimmon consumption may also result in diarrhoea, most likely due to the high sugar content of the fruit. At the moment, there are very few nutritional and sporting supplements with persimmon and its extracts in it. 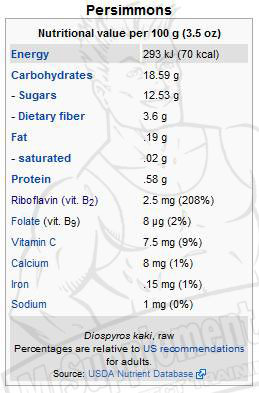 There are however, teas containing persimmon leaves claiming it to be beneficial for fat loss. With its wide ranging health benefits potential though, it could definitely be used in fat loss, thermogenic or carb blocking supplements in the future. At the moment, the best way to get the benefits out of persimmons is to consume the fruit itself.